Cia Plasticiens Volants is a French street theater that does shows with giant inflatable dolls around the world since the 70s. For the first time in the country, the famous company brings the presentation called 'O Estrangeiro' (The Oversea) and with special participation of the twin brothers osgêmeos (famous Street Artists from Sao Paulo). 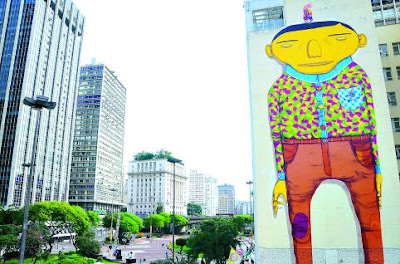 They have a famous character called 'Boneco Amarelo' (Yellow doll), which is already painted on the sidewall of a building at Vale do Anhangabaú and it will turn into a giant inflatable 20-foot-high, along with the other characters come to life and flying over the streets of the Vale do Anhangabaú. The 'Boneco Amarelo' is handled from a balloon. The character comes out of a panel painted by the brothers on the side of a building in the region that will be there permanently, and throughout history, interacts with a fly, a snake and a bird, animals that will help them become more autonomous, to face danger and learn to fly. The presentation will start at 6h30pm and it will be groups from Pernambuco State, Siba e a Fuloresta, playing during the presentation.